Top > Study > Virtual currency > About management of Bitcoin. ■ About management of Bitcoin. With the property of Bitcoin , banks doesn't exist in the world of Bitcoin. In other words, safekeeping and the management is the personal responsibility. 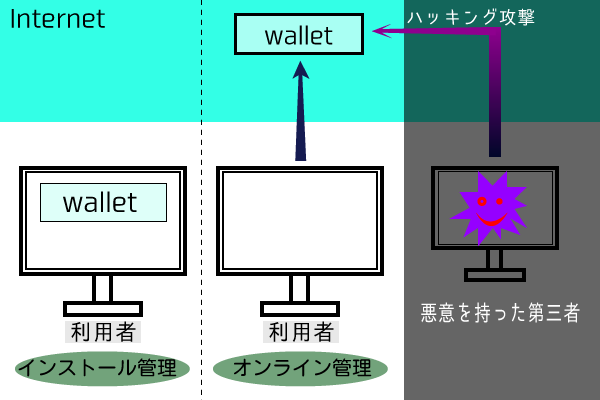 So, to use it, we need to make a Bitcoin wallet that has necessary information for we receive Bitcoin and pay it. Bitcoin wallet so called wallet of Bitcoin. When greatly divide it into a Bitcoin wallet, and there are two kinds. One is we can manage it without Internet environment by installing it in our PC. The other is establishment on the Internet and manage it on online. The latter is inferior to the former on security. Because the latter may encounter hacking damage. However it has a merit that if there is Internet environment, I can manage it anywhere. ▲Online management is convenience, but on the other hand it may encounter hacking damage by a third party with the malice.